You can expect quality, value, and style when you order Bali custom blinds and shades. These energy efficient cellular shades use a honeycomb design to provide outstanding insulation for your windows, reducing your home's heating and cooling bills all year round. The soft, crush-resistant fabric will maintain its shape while adding both subtle texture and great color to your windows. Plus you can choose either light-filtering or room-darkening fabric for controlling the light in each room. 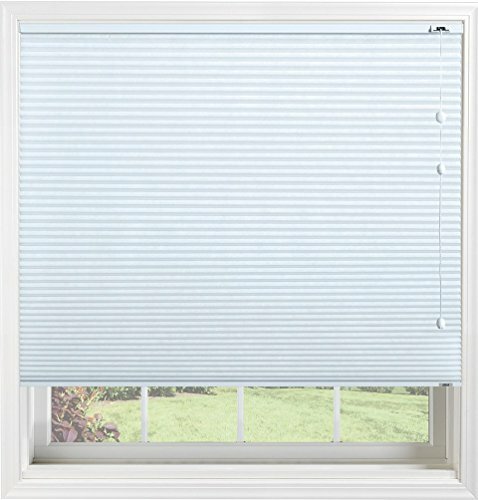 Designed to be mounted inside the window frame, these shades come with a coordinating steel head rail, cord cleats, and all necessary hardware for easy installation. This product has a limited lifetime warranty. If you have any questions about this product by Bali Blinds, contact us by completing and submitting the form below. If you are looking for a specif part number, please include it with your message. Bali Blinds 3/8" Custom Light Filtering Cellular Shade with Cord Lift, Spa Blue, 35.5" x 29"
Bali Blinds 3/8" Custom Light Filtering Cellular Shade with Cord Lift, Spa Blue, 36" x 25"
Bali Blinds 3/8" Custom Light Filtering Cellular Shade with Cord Lift, Spa Blue, 34.5" x 22"
Bali Blinds 3/8" Custom Light Filtering Cellular Shade with Cord Lift, Spa Blue, 35" x 33"